The Nueces River valley plummets from the Edwards Plateau with the abruptness of a summer squall. The topography plunges from dry to drenched when you cruise south from Rocksprings on State Highway 55, blank skies giving way to blue-green canopies of oaks and pecans as the road abandons the grassless flats for glimpses of resplendent waters that seem to chase canyon twilight into the brightness of day. Here, the Nueces River finds its voice: a convergence of forks, prongs, creeks, and springs that begin their last odyssey to the Gulf of Mexico as one. A deep, abiding beauty is tucked within this river valley, and lying at its heart is the unassuming community of Camp Wood. The town of 706 people offers an economy of virtues: no crowds, no jet skis, no traffic, and little noise; instead, the simplicity of countryside, a swim in nature’s pool, maybe a little fishing, perhaps a picnic or a plate of barbecued brisket, and a good night’s sleep. On State Highway 55 south of Camp Wood, the park offers camping, swimming, picnicking, and a boat ramp at Lake Nueces. In this rural corner of the Texas Hill Country a little over two hours northwest of San Antonio, accommodations are economical—both in extras and on the wallet—and will satisfy an urbanite’s craving for rustic reprieve. Try the family-owned, motel-style Woodbine Inn, a bargain for the budget-minded with a selection of rentals located in town and along the river. To accommodate extended family and friends, additional options for vacation rental homes can be found around town. 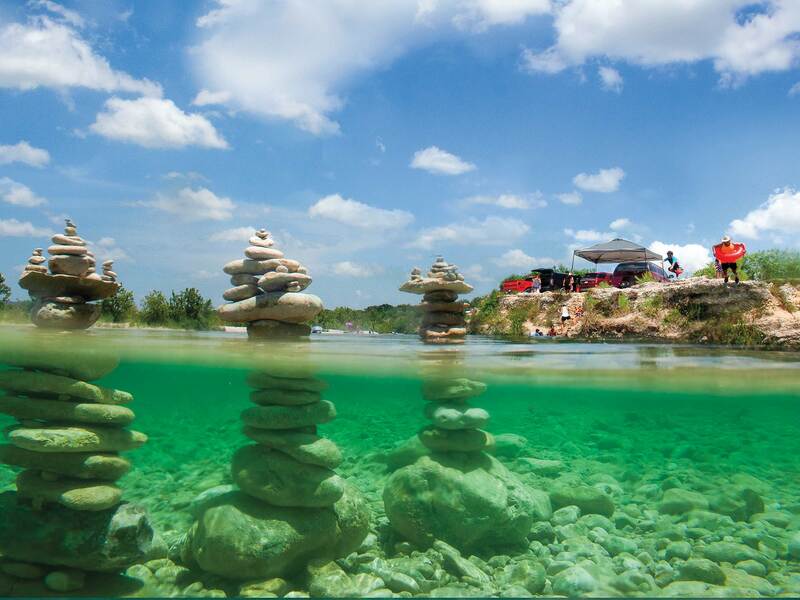 Or go old-school and bring a tent or RV, or rent a cabin at Los Rios Campground on the edge of town and across River Road from the banks and bluffs of the Nueces. Each cabin features heat and air-conditioning, a bathroom, barbecue grill, and fire pit. 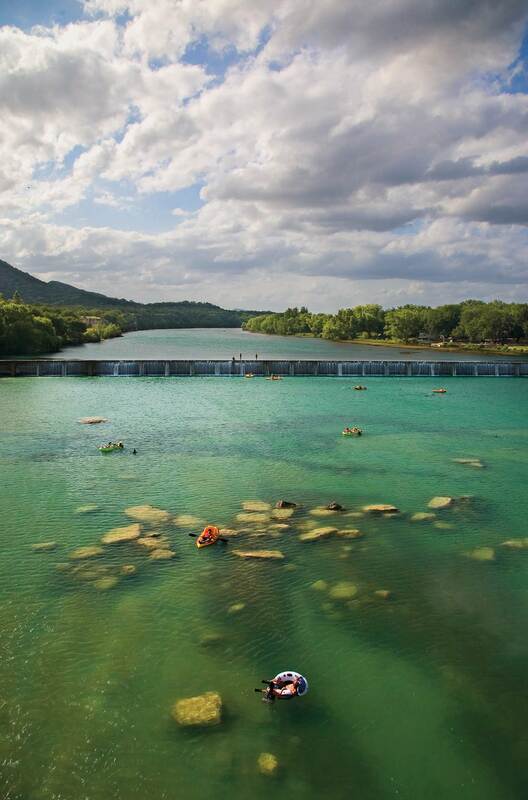 On weekends in the summer, a parade of families line up beneath the Highway 55 bridge crossing on the Nueces south of town to fire up their grills and float in the shallows below the short dam, which holds back the pint-sized Lake Nueces. Others take a break from burger-flipping to sun on river rocks. Visitors who are too carefree to cook can find authentic Hill Country flavor at King’s Texas Smokehouse. Family owned and operated, the Smokehouse serves up hot food like “The Beast,” a sandwich loaded with sliced brisket, smoked sausage, bacon, pepper jack cheese, grilled onions, jalapeños, and trimmings. Or exceed your fill of brisket, sausage, and ribs at Two Fat Boys BBQ, which also grills steaks on Saturday nights. The boys, Ed “Chug” McCameron and Bob “Shiska Bob” Foster, launched their enterprise on the edge of town almost a decade ago with a 500-gallon propane tank they converted into a smoker. A few years in, Foster sold his share to McCameron, who continues to anchor the town center in sprawling rustication, occupying half a city block with two generous dining rooms, porch seating, a fire pit, and plenty of motorcycle parking. Camp Wood’s biggest draw is still the Nueces, a braid of aqua, indigo, and grass-green strands ambling alongside the outskirts of town. Swim for free at the local swimming hole—a natural deep plunge below short bluffs known as “the Quince,” which is pronounced keen-sey, Spanish for 15, and named for the average water depth just below the bluffs. Or drive approximately 3.6 miles south of town where the river gathers behind the Lake Nueces dam. Here, Wes Cooksey Park offers RV and tent camping, picnicking, and swimming, and a boat ramp for paddlers and boats with motors of 25 horsepower or less. The park charges $4 per person per day, not including overnight camping. Relaxing in the Nueces shallows or deep-diving from its bluffs, it’s easy to forget that these waters possess a complex and notable past. The Nueces was the first river in Texas to be given prominence on European maps, designated the “Hidden River” by a cartographer in 1527. French explorer René-Robert Cavelier, Sieur de la Salle mistook the river for the Mississippi during his 1685 expedition, and in 1689, Spanish explorer Alonso De León called the river “Nueces” for the abundance of pecan trees populating its banks. Despite the fact that it already had a name, De León’s “Nueces” stuck. Perhaps “Chotilapacquen,” a Coahuiltecan name for the river, was too challenging for interlopers to pronounce. In 1762, the river’s year-round water supply gave Spaniards the confidence to establish a mission called San Lorenzo de la Santa Cruz along a ridge above the banks just north of present-day Camp Wood. Although the river delivered on its offer, the Franciscans fell short of their own promise, realizing relatively quickly that the Lipan Apaches they aspired to convert had no interest in Catholicism. Instead, the Apaches used the mission’s protective compound to fend off enemies, including the Comanches and their allied bands. The Franciscans abandoned the mission in 1769. A historical marker on State Highway 55 at the north end of town denotes its location. Humans lived on these banks of the Nueces River for several millennia before the Spanish arrived. The U.S. military, pioneers, Texas Rangers, the railroad, cedar choppers, and goat ranchers all came after the Franciscans, followed by the arrival of today’s recreationists. Remarkably, Camp Wood continues to draw its drinking water from the same supply the Franciscans relied on for their mission, suggesting the past endures even as the Nueces flows into the future.